On Saturday, two of my best girlfriends and I went out for supper and had a late Christmas gift exchange. One of the gifts I received happened to be Pure Vanilla, a book that had been on my Christmas list, and one that I had completely forgotten I told my friends about. To say I was on cloud 9 when I opened the gift would be an understatement. I found myself reaching for the gift bag, pulling the book out, and sneaking a quick peak on more than one occasion during the night. It was pretty difficult to pick a starting point as everything in this cookbook is ah-mazing. This recipe stood out to me, as it was something I had never made before. And to say I’ve never made it is odd, because I’ve made pastry cream in the past for cakes. 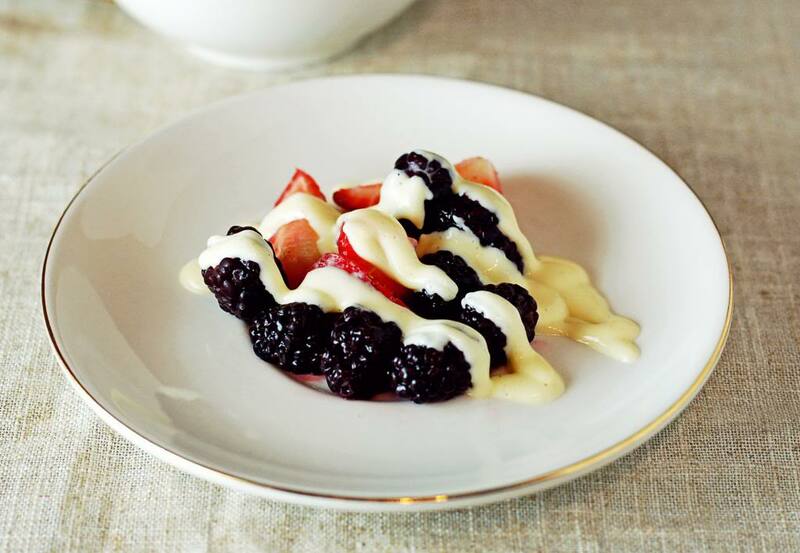 You simply omit two ingredients (cornstarch and butter) and Bam… you have Crème Anglaise. Once it has been chilled, it firms up and can be dolloped easily. Crème Anglaise is a classic creamy custard used in puddings, pies, bread pudding, crepes and drizzled on fruit. I love its versatility, and simplicity and it’s one of the best ways to use up leftover egg yolks. Don’t let the fancy name scare you away. 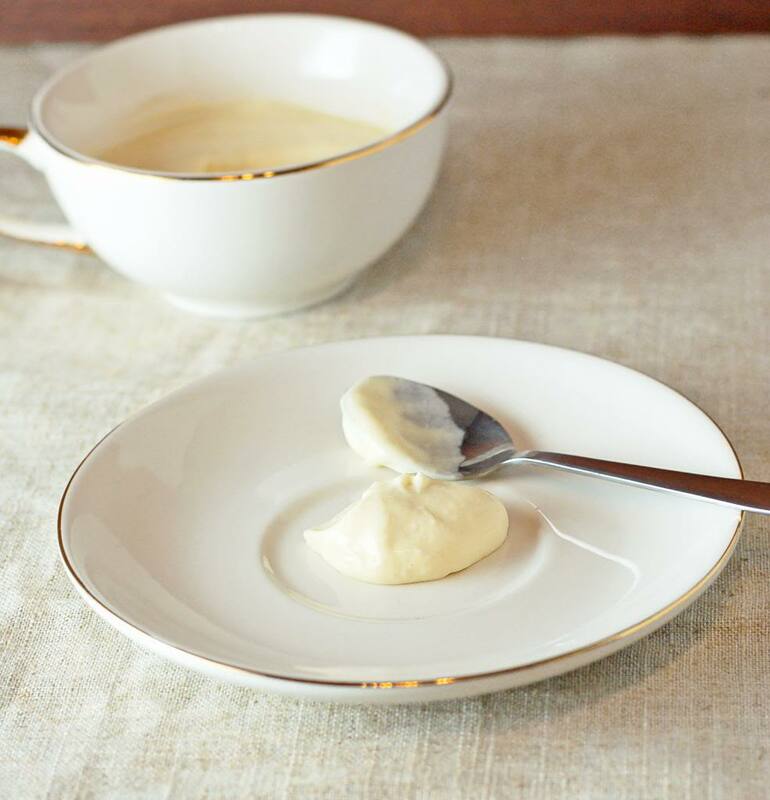 Crème Anglaise is only 5 ingredients, and quick to make. It can be made ahead of time since it keeps so well in the fridge for a few days, or used immediately.Now you know the beauty that is Crème Anglaisee, later this week, I’ll show you several other ways to incorporate it into your repertoire. In a saucepan over medium heat, combine milk and vanilla bean and bring mixture just to a simmer and remove pan from heat. Do not let it boil. Pull out vanilla bean and using the back of a small knife, scrape any remaining seeds into the milk. In a large bowl, whisk together egg, egg yolks, sugar and salt until mixture lightens in color, about 1 minute. Slowly whisk the hot milk mixture into the egg mixture, whisking constantly until well blended. Pour mixture back into saucepan. Over low heat, whisk mixture constantly until it thickens and coats the back of a spoon. Do not let it bubble or the eggs will start to scramble. Transfer to a blender, add the vanilla extract and blend until smooth. Crème Anglaise can be made in advance and stored in an airtight container in the fridge for several days.